The Heritage Motor Centre, an award winning, high-profile contemporary venue, is continuing to expand the arm of its successful Conference business. Continued growth in occupancy rates has enabled the Centre to recently make two senior promotions and undertake a re-investment programme to continue to upgrade its facilities. Tom O’Reilly has recently been promoted to Operations Manager from Catering Manager and will oversee the overall management of the Conference Centre. Tom has been with the HMC for 16 years, joining in 1997 from the Chesford Grange Hotel. Tom has also recently been voted onto the British Culinary Federation Management Committee which stands to promote culinary skills throughout the industry. He shares their vision for achievement, training and quality as well as a rich tradition of culinary competition. In addition, Jeff Coupe who has been with HMC for 12 years moves from Head of Operations to the role of General Manager. Room occupancy at the Centre is up 4% to 88.2% for the first 4 months of 2013 compared to the same period last year. This increase in occupancy is on top of an increase in capacity with 3 new syndicate rooms being brought online in late spring 2012. Some of the Centres medium sized rooms are now achieving 100% occupancy. The ‘not for profit’ organisation, is constantly re-investing in the conference centre facilities as well as the Museum, home to the largest collection of British motor vehicles in the world. The re-investment this year has included equipment upgrades in all of the 24 meeting rooms plus new carpets, flooring, additional conference chairs and re-upholstery of existing ones, new external signage, new reception seating and tables, additional CCTV cameras and new energy saving Museum floodlights. 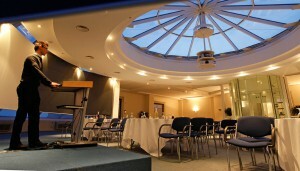 Set in 65 acres, the HMC provides a unique environment for conferences, exhibitions, events, product launches and gala dinners. The Centre offers a range of experiences from free access for delegates to explore the Museum to tailored adrenaline fuelled off road Land Rover Experiences. To find out more information about the HMC please visit the website at www.heritage-motor-centre.co.uk or call the Conference Team on 01926 645040.